Joining the prelude to the most anticipated MMO expansion. n a welcome change of fortunes, I found myself on the first list of invitations to the beta testing phase of the Cataclysm expansion to the planet's de facto MMO, World of Warcraft. Cataclysm's leading proposition is the eponymous reshaping of Blizzard's fantasy world. With the addition of several new geographical areas come changes in varying degrees to places where players have adventured for six years. Rebuilding the original two continents in Azeroth also obviates graphics limitations preventing players from flying about on griffins, dragons and more. Judging by my airborne reconnaissance, the result is a vast, continuous landscape that sets Warcraft even further ahead of RPGs whose environments are no more than stage settings. Changes to the original continents set the game even further ahead of other RPGs.Given that I play the Alliance faction, and have reservations over spoiling too much of a game I intend to savor from launch day forward, it seemed pragmatic to test a character from the race joining the Horde for the expansion — a goblin. Blizzard has put half a decade of design in practice with the introductory areas and quests. My green, little debutante in the Bilgewater Cartel advanced as if the center of the story; ironically, such a singular focus works well to establish the character one might play for years in a socially galvanized MMO. Likely in response to discreet surveys of subscribers' computing power, Blizzard's art department has lavished goblins (and their Alliance counterparts, the lycanthropic worgen) with textures and animations approaching aesthetic standards of titles that don't have common denominators factored at 11 million. Pluses? I can't get enough of my darling shaman — it's a treat to watch her scamper. Drawbacks? So far, the eight original races have not been revised, and detract from Cataclysm's energetic style with their frumpy, pixilated looks. The expansion will be better received if at least most of it doesn't appear to be left over from 2004. For those of us seduced by game editors and development tools, pre-mades are candy boxes.Fruitful sampling of content requires a high-level character, and since the beta game-world resides on a series of isolated servers, players may copy an existing character or activate a pre-made character. For those of us seduced by game editors and development tools, pre-mades are candy boxes. How about five in-game containers full of armor, weapons, rings and trinkets for two talent specs — including every last raw material that could possibly be of use to maximized skills in the jewelcrafting and enchanting professions? I only hesitate to begin assembling my test subject because gameplay mechanics remain tenuous, especially after yesterday's announcement. 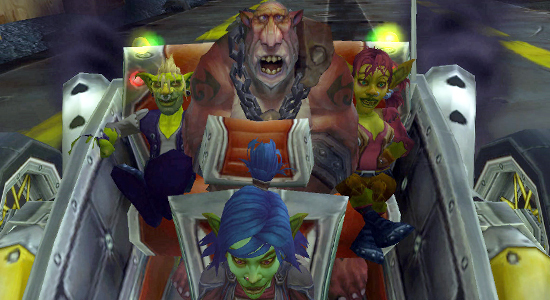 Perhaps to mollify very public controversy over planning to expose the full names of players in Warcraft's official forums as part of its comprehensive Real ID network — or in the latest masterstroke of the industry's unpredictable phenom — Blizzard's design team unveiled preparations for character class advancement that is simpler and more immediately gratifying, rewarding characters with touchstone abilities long before maximum-level endgame. As a consequence, of course, any experimentation carried out before the new system emerges will be academic. What's a beta tester to do?